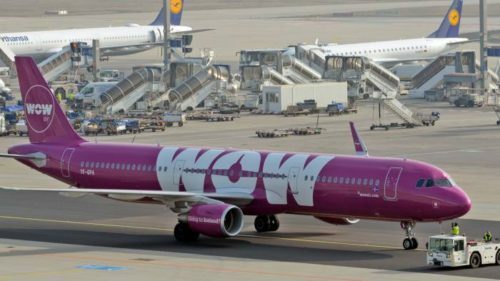 Icelandic airline Wow Air has collapsed, stranding thousands of passengers, after an apparent failure to secure a cash lifeline. It had grounded aircraft early on Thursday following months of talks with prospective financial backers – saying it was in the final stages of negotiations with a group of investors and further information would be provided later in the morning. However, the heavily indebted company later said it had “ceased operation” and cancelled all future flights. The budget carrier is the latest in a string of airlines to fail over the past two years – as oil prices have risen sharply in a competitively-priced market. Monarch Airlines, Primera Air, Flybmi and Air Berlin have been among the most recent casualties while struggling Flybe was bought up by a consortium including Virgin just last month. Wow used its Reykjavik base as a hub airport to connect Europe and North America – with UK services operating from Gatwick, Stansted, Bristol and Edinburgh. The airline was founded in 2011 by its chief executive, Skuli Mogensen. It started flights in 2012 and grew to employ 1,000 people, carrying 3.5 million passengers last year in its 11 aircraft.